Why don’t you take a walk in KIMONO? 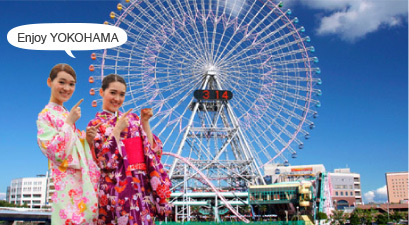 Let’s go shopping or eat out in Yokohama Minato Mirai 21 (Kanagawa) or Fukuoka Tenjin (Fukuoka) with KIMONO, the traditional clothes! KIMONO would be the best experience ever in JAPAN! You don’t need anything but yourself! Everything is ready for you! Close to the tourist attractions and easy to get there! Don’t waste your money on storage. or fragile items (camera, laptop, etc.) cannot be acceptable for storage. “Tabi” is traditional socks, great match with KIMONO. You can take “Tabi” home as a present! Once your booking has been confirmed, you will receive a confirmation email. Once payment has been done, it is time to choose your KIMONO. We are happy to help you find your favourite KIMONO! Now it’s time to get dressed up! Just relax. 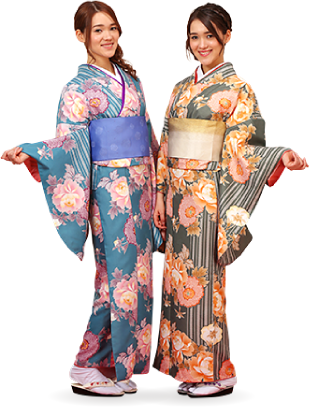 Our professional staff will dress you in KIMONO. 4. Let’ go for a walk! You are now ready to roll! Leave your stuff at the shop and let’s take a walk! Why don’t you go to cafés or restaurants? There are lots of places to see around! How was your day? Did you enjoy your KIMONO experience? Please come back before 6pm. We will help you undressed and your fantastic day is over!! Yokohama Minato Mirai 21 is a major center for business, shopping and tourism. It is close to the sea and lots of amazing places to see around! SKY GARDEN is on the 69th floor. You can see the amazing view of YOKOHAMA. One of the biggest Ferris wheels in JAPAN!! Iseyama Kotai-Jingu Shrine was built in 1870. It is very historical place and would be a great visit with KIMONO. Tenjin is one of the largest down town areas in Kyushu. There are lots of amazing shopping areas and restaurants! This historical shrine is located in the middle of Tenjin. There is Kego Park right next to the shrine.